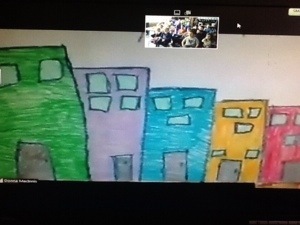 Earlier this week we video conferenced with our grade 2 friends in NFLD to learn about their community and what it is like to live there. 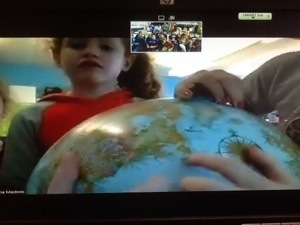 We learned that NFLD is an island on the East Coast of Canada that is surrounded by ocean. They get to see iceburgs which are chunks of ice that break off from glaciers and float in the ocean. We learned that living in NFLD is a lot like living in Ontario. We both have 4 seasons: winter, spring, summer and fall. We wear the same kinds of clothes and we get around by walking, driving, taking the train, and flying. We also learned that we have the same kinds of pets, like dogs, cats, and birds. One thing we learned that was different is that they eat foods like moose burgers, seal meat, rabbit stew, and pea soup. These are not foods that we eat in Ontario (but some of us eat pea soup). When we shared some of the foods we eat and they had never heard of a pepperette. Maryn explained what is was and they thought that was cool. We also learned that their houses are different than ours. Most of the houses they live in are attached to each other. 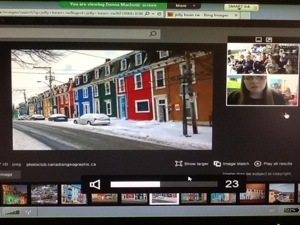 In downtown St. John’s there is a whole street of attached houses that are all different colours called JellyBean Row. We thought this looked like a fun street. We don’t have houses like that in Ontario. Most of us live in a duplex or detached home. Thank you to our friends in NFLD for teaching us about your community. You are awesome!! !